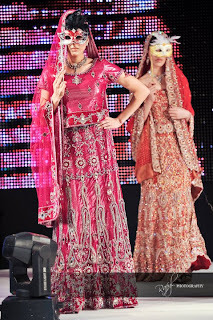 I hadn't really heard of Ishy's Boutique before seeing them on the catwalk at the Bradford Asian Bridal and Lifestyle exhibition, but having already seen collections by all the other designers at this show I was keen to see what this Birmingham based store had to offer. I didn't really like any of the other outfits either - usually I'd say purple and gold makes for a nice colour combination, but in my opinion this lehnga below is overkill on the gold! If I had to choose one outfit as a "favourite" and (I use the term favourite very loosely here) it would be this light pink gown, however again it's really badly fitted - there's no shape to it and it almost looks like it's falling off from one side showing off the model's bra. A big thanks to Rafyl from Rafyl Photography for these photos. Would love to know your thoughts on this shop because the impression made on me from the fashion show wasn't very good! Are they better than this? went into the shop and ordered a bridal outfit . the staff working there were very helpful and the owner sat me down and told me what he could or couldnt do. family went back and ordered 8 outfits. ishys owner arun was very helpful, thanks ishy you made my day special. clothes seem badly fitted and the masks are hideous. I'm not saying the positive reviews above are fake as I have no way to verify them, but it's a little suspicious that they all follow a similar format and were posted within a few days of each other. What do you think readers? hi its fara coventry i am genuine and i do love you site simply because its informative, ishys done me a brillant outfir but more thsn thst they went out there way for me. ishys i thank u and nazma take a trip down and c ishys "arun" and u will understand why i praise them. DO NOT, DO NOT SHOP HERE!!! My wedding is within a few days and the outfit has not arrived. I'm still fuming after going to the shop today. The outfit is over a week late in arriving as it is. I was told at the time that I had ordered it in good time. They say they'll call to update me, I hear nothing, they have no details of the order in the shop and apparently a manager holds them. They WILL NOT provide contact details of the owner/manager. I'm surprised at the reviews especially re: this mysterious owner. I think the blogger is correct some of the reviews are dodgy. The useless, shop assistant, informed me that I should not worry as another girl is in the same position as me. SO THAT'S TWO WEDDINGS THEY'RE RUINING! another two glittering reviews left within 10 minutes of each other at an unusual time of the morning, am i too suspicious?! Lol it is a bit suspicious and I suspect it's due to their bad service and the fact they've a complaint against them with trading standards. Clearly after having so many complaints they decided to trawl through the internet to see whether there had been any negative reviews and try to counter balance it. The bad grammar and spelling of the positive reviews appear to follow a similar pattern. p.s. I forgot to give an Ishy's update the service went from bad to worse for my wedding in September 2011. I attempted to get a refund from Ishy's a week before my wedding but they refused. I had to try and find another outfit. After going to the shop and really complaining they finally allowed me to speak to the manager owner who is a woman called Ishy/Ishrat her husband Haroon/Arun apparently owns a chain of newsagents in Birmingham. They're now trying their hand at wedding clothes. I'm not sure how I feel about having a wedding outfit designed by a newsagent! I had someone pick up the outfit 2 days before the wedding as I could not stand seeing anyone connected to that store. I had no choice getting it as they would not give my money back. They offered no apologies, no discount or explanation for all the lies as to where the outfit was. Believe me weeks before I was told everything under the sun. It's only after the wedding I realised the outfit they had given me was an outfit I had tried on in the shop. It was similar to what i'd wanted but not the right shade. They had simply sent it away to attempt to make it a corset top by putting in two pieces of boning. I wondered why it wasn't to my measurements or not fully corseted. It was huge on me! I can't speak for the service experienced by others and only say what happened to me DO NOT SHOP HERE ALWAYS GO FOR SOMEWHERE RECOMMENDED TO YOU PERSONALLY. READ AN EXCELLENT BLOG ON THIS SITE BY SUMMAYYA DARR FULL OF SUCH ADVICE. Salaam and I wish you all the best in finding your perfect outfit. Btw my wedding day went perfectly despite the horror before! Wot can i say, except that what has been written already...... THEY PROMISE YOU THE BEST SERVICE, THE BEST DESIGN AND THE BEST PRICE.....but what a load of codswollap!!!!!! !...they're simply a joke and DO NOT DELIVER WHAT THEY PROMISE......STAY AWAY!!!!!! Argh wish I had read these reviews before I had ordered. Tge bad reviews are all correct. In such a bad mood that I can't be bothered writing it all at the moment but you'll get an essay from me as to how bad my very recent experience with Ishy's Boutique has been. DO NOT SHOP THERE. it won't be a pleasant experience and trust me you don't wanna get White hairs on your wedding day from the stress of the experience. The service is disgusting and the owner is just as bad! Blatantly lying to customers and fobbing them off with excuses. Funny how the positive reviews are all in the same style - really bad grammar and thanking Arun as if this is his website. You do know what this article is about and why you're writing a comment right?! If you have a positive remark as to the store then just state that, you don't need to write it direct to the store! P.s. love the Poonam touch - bit of diversity and all that.